Shall we be honest? I mean really honest? The kind of honest that makes you cringe a bit at the reality of your answer. The kind of honest that makes you want to not quite tell the truth? Uncomfortable honesty? Shall we? Well I think we have to be because if you walk into any garden centre, the amount of plastic there is to buy, with gardening things within it obviously, is enormous! Forget for a moment about the pots the plants are grown in and the compost bags, and lets look at the paraphernalia. Seed sowing equipment is all made of plastic and in many cases plastic that although isn't sold as single use, really is. Cheap module trays which we are all guilty of picking up and using to be slightly frustrated but the fact they fall apart when you take a seedling out, being the prime example. But also often these trays are covered in plastic wrap, for no plausible reason I can see! And then look at cheap watering cans. And be honest. How many have you bought in your lifetime? Picked up at the beginning of the season and left outside in the frost to find them split and broken the following season; how many do you buy in a lifetime? Probably enough to buy one expensive metal one that will last a lifetime and then go on to be a planter? And when we buy bulbs why are they encases in plastic? That awful thin and crinkly stuff or plastic bags, all of which are single use, throwaway plastic that isn't needed. Why can't we go back to the good old days when we bought bulbs individually in paper bags, with nothing more than a photo in the bucket we picked them out from? And yet I remember when things were different. As a child my biggest thrill in the summer holidays was going to Smiths Nurseries in Otley, West Yorkshire, to buy new bulbs and next years sweet pea seeds with my Grandma. We often would tootle off, just the 2 of us, on the bus, and the outing took almost all day. We would arrive in Otley, have lunch at a local cafe, and then walk swiftly to Smiths, where each summer there was a huge range of bulbs, all in cardboard boxes, raised up, with one photo, often of dubious quality, to show what the flower would look like, and a little bit of info about heights. In inches! Picking your bulbs meant just that-picking them from their boxes and placing them in paper bags that we then took to the till. Because they were all priced according to species, you were expected to know how many bulbs were in each bag and the person at the till could recognise the species just by looking at the bulbs. Mainly by this time of year most other stock had been sold so there weren't bright displays of anything herbaceous, but there were hedging plants and some winter shrubs I remember as well as a big notice to say they were taking orders for bare root trees, shrubs and roses and herbaceous perennials and that you could order on site or visit in late January and February when they would have a good selection of bare root plants to buy. There was compost, manure and terracotta pots to buy, as well as a range of hideous chemical (it was the 70's after all) and a selection of sturdy Bulldog tools, at that point still made over the Penines in Wigan. And that was it. No houseplants because you went to a florist for them. No magazines because they weren't a newsagent. No trinkets. And no Christmas tat because they shut after the bulbs had gone to concentrate on the following season, redirecting the staff to potting on what was left from the previous summer, moving shrubs and trees into larger containers and planning the early spring, when we would no doubt visit again for a rose, or a shrub, or seed potatoes and rhubarb. The plants were locally grown, the staff were local and they taught their staff as they went along. A local business supporting it's local gardeners and it's local community. And yes there were plastic pots but they were recycled over and over. And yes they would sell you compost and manure in plastic bags but you could have it delivered by the ton and most gardeners did. So what has happened? How did we, in the space of less than a lifetime, get to this stage where in many ways gardening seems to be as much about acquiring stuff as it is about actually gardening? Well I guess that's the story, in many ways, of globalisation, and in many ways globalisation is no bad thing. But in the way it encourages us to buy stuff, without really thinking about the impact of that stuff, it can be dangerous. So what do we do? Can we go cold turkey on plastic? Or even should we? My thoughts are this, and they are only thoughts from a lifetimes pondering on my own impact on our earth and are definitely not scientifically proved!! Avoid buying single use plastic and if it's there and you can't avoid it, remove it from whatever it is you are buying at the till and ask the retailer to throw it away. If enough of us do this they will need to listen because it costs money to get rid of waste and that isn't something most retailers want to spend profit on. Find a place that will recycle your plastic pots once they are so exhausted they are no good to anyone. Some independent garden centres and nurseries will do this and it's really worth seeking them out. If you are in Bristol, Cleeve Nursery does this, but there are different schemes appearing every day right now. Buy bare root plants in the winter and request they re wrapped in paper. Bluebell Cottage Nursery have just announced all their mail order will be plastic free from this year so it can be done by mail order specialists too. Ask anyone you order from regularly to do the same. Use your compost bags as planters, to line things, cutting drainage holes in first if needed, or buy in bulk. This is tricky as most garden centres and nurseries don't have this as an option, but organisations such as Compost Direct will see direct to gardeners and allotmenteers, and whilst their dumpy bags are plastic, they are of a grade that will see them useable for years. Or ask them to take them back once they are emptied and you are ordering more. This is very far from the average post from me, but it was heard said during the week that I am difficult to buy gifts for and once that had been dug into a little, ( no apologies for the garden puns) what it actually meant was, I have no clue what you might want because it's a mile away from my comfort zone. So here goes. 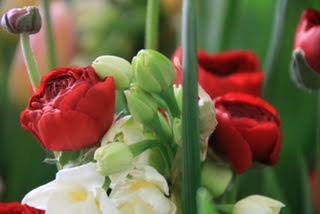 A glorious bouquet of British grown blooms, that are not difficult to source as long as you are aware of where to look! Both Flowers From The Farm and the British Flower Collective websites will send you in the right direction. A plant. Not rocket science but us garden folk love our plants and this is the time of year to get our there and start looking at any new purchases. I am very good at leaving the David Austen catalogue open at the page with my newest desire on, but in reality just ask what they might like! And then pop onto the Independent Plant Nursery Guide to find your local nursery that stocks said plant. Easy!! A gift voucher. There are always things we look at longingly but would never buy ourselves and gift vouchers always make me splash out on things I want rather than what I feel I need. National Garden Gift Vouchers are accepted at a huge variety of garden centres, nurseries and garden shops, or if you know the gardener in your life to be particularly fond of a certain online garden store, buy those! 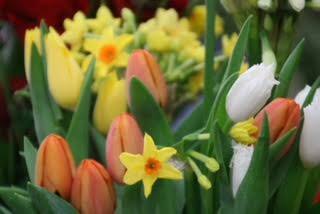 Crocus, Sarah Raven, Chiltern Seeds to name a few offer vouchers but there are many, many more who do. A Gardening Course. Whether it's Flower Farming for Beginners at Common Farm Flowers, or a day with Charles Dowding, lots and lots and lots of people are now offering amazing days where you not only learn loads but also have a thoroughly amazing time in the process!! You could even send them to us at Incredible Edible Bristol!! Books and Magazine Subscriptions. I can't even begin to suggest books or we will be here for an age, but great gardening books appear all the time. If you aren't sure about what she has, or are pretty sure she has what she wants, look at a magazine subscription. Often as a subscriber you get special offers so if you know a certain publication gets flung into the shopping trolley monthly, order her that! There are also a fair few independent magazines now, such as Rakes Progress, that are only available in specialist shops, so that's a great alternative to the mainstream magazines. A Promise.......What most of us want is to spend time with our children, be they 5 or 45. Time is our most precious gift, and in our busy lives we often forget that. So particularly if you are an adult child, the promise of a day out in the summer to a garden of your choice is a gift that no money can buy. Whether you choose a local garden opening for the NGS or a big garden belonging to the National Trust or similar, spending time in a garden with the people you love cannot be beaten. For some Mothering Sunday is a difficult time. Difficult family dynamics, loss and more can mean for many what is meant to be a glorious day celebrating motherhood, is one of sadness and despair. If you know someone who you might just suspect is in this group, engage them in your day if you can. Maybe get them into a garden, give them some time, a hug, a cuppa. Mothering Sunday is as much about kindness as anything else and no amount of gifts will ever make up for that kindness, whether it's from your own children, friends or others. Never underestimate it!! And as a quick FYI no one has paid me to advertise their wares here, and other gifts are available!! Gardens, plants and growing have been my life for as long as I can remember. A yearning to be outside, growing beautiful plants and creating wonderful spaces is my reason for being and I consider myself the most fortunate person alive to be in the position I am, not just doing this myself, but also supporting other people to join in, have a go and celebrate their success. It gives me untold joy to support people and organisations to improve their environments with gardens, be they productive or ornamental, large or small. And the way these spaces change communities, getting them up and active, engaged and excited, is the most humbling and amazing thing. I am, to use a social media phrase, blessed. But throughout this career have been some very dark periods, all of which have been created in the first instance, by bullies. Workplace bullying is difficult. It is often wrapped up in conversations along the line of conflicting personalities and comments around ability and the bully knows exactly what they are doing, and how careful the line must be that they tread whilst constantly dripping negativity about the person into the ears of everyone around them. For months I dreaded opening my emails, and regularly received emails telling me I was wrong and he was right. On one occasion these led to a a huge dispute between directors who at that point were seemingly taking sides, and a huge argument in my office, with me there, about how the issue was being dealt with. I dreaded going to work, despite being totally in love with the beautiful walled garden nursery I was managing, because here was someone I had to liase with daily who was trying to get rid of me. To drive me out. Fortunately at the same time I joined Twitter and looked for other gardeners, and the relief was palpable when I was able to join in conversations, support others to garden and slowly, very slowly, although work was beyond distressing, I began to believe in myself a bit more. I started to run workshops, to have a horticultural life away from the workplace and things felt like they might be ok. But as with everything, there are highs and lows and a year before I left this workplace I had a serious breakdown. It followed an event where the bully had openly been slating me for being "lazy and useless" when a good pal was in the room, and unbeknownst to me, she made a formal complaint and it was taken to HR, who were so concerned they suggested that the gross misconduct line had been crossed and he should leave. But that didn't happen and instead he upped the pressure, finding my Twitter account and recounting it to the owners of the business. At this point they knew nothing of the workshops and courses because I had done them in my own time, either at weekends or taking annual leave, but they insisted they stop if I wanted to continue to work there. Very quickly Twitter went from being my safe space to one where I could say very little, despite having closed my account down so tightly that for several months I didn't even allow new followers. But at this point I knew what was happening. I had seen the bully for what they were. Just that. A bully. I had tried to have conversations, to work harder, to prove myself but after the first few weeks I knew I needed to be brave and leave. The final decision came when I was told that there were concerns about my "severe" depression, which was frankly not correct but more worryingly I knew the information had yet again been gleaned through social media and at that point I took control. They let me go stating non transferrable skills which made me hoot as the skill that I didn't have was driving. It had been assumed I would drive the owner around in the evenings to talks and events, which had never been mentioned at the interview and which I would never have agreed to. I left with my head held high and at that moment promised myself that I would never be afraid of a bully again. Why are you telling us this tale now I hear you asking. What is your point Sara? Well without going into the minutae, bullying happens on many scales and I have promised to stand up, with a lot of other people, to a particular bully in the city. And I am scared. I want to run away. I am close to tears and I feel alone. My voice feels broken, silenced in fear. I woke up this morning and for the first time in 5 years didn't have an immediate tweet, was afraid to speak my truth. Name drop alert here, but last year I sat in a garden with Dave Myers and spoke openly about all this. Sadly it didn't make the cut, but he and the entire team were moved beyond words by the strength it sometimes takes to stand up and ignore the negative voices. Horrified that an industry that seems to be all about the environment, making beautiful spaces and being kind to our planet, can be so cruel and harsh. After leaving the last job it appeared it was a well known fact that the person was like this and it soon transpired there was a whole line of people before me that had been through the same. But no one will speak, even years after, in the belief that they signed a confidentiality clause in their contract and they would be honed down on by solicitors and the law. I never signed that clause, but equally I am never going to name names. That would make me the bully and that is something I am super conscious of, but it never fails to amaze me how years later the effects can still be seen in people. It never leaves you. The fear is what remains. Why am I telling you this now? Because it is my truth and it explains a lot about how important i feel compassion and kindness is. Because I feel like bullies can create huge and unpleasant schisms and that isn't fair on all the people it affects. Because bullying leads to poor mental and physical health that over the years it becomes harder and harder to bounce back from. Because I hate to think that anyone might have been so abjectly affected by it that at times they may too have felt, or feel like their voice is squashed and they are silenced. Today its Valentines Day and as it draws to an end I have just seen a post from a friend on Facebook asking whether Valentines could be repurposed into a day where we promise to treat people with care and respect in the year to come. So here I am committing to do just that. To lead with kindness from my core in everything I do, because that is the only way we are going to find a kinder world. 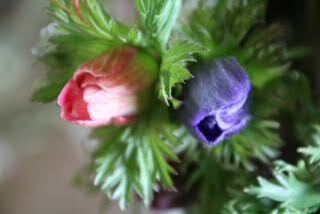 Those of you who regularly read this blog will not be one bit shocked that I am about to talk about British Flowers. It is a regular post in my year of posting and every year I promise to do more to support the British Flower growers with whom I talk across many social media platforms. Small production has a special place in my heart, not just of flowers but generally. Farmers, makers, flower growers are all amazing people, fighting for their industries and supporting the local economies of small towns and villages across the country. I have long yearned for my own patch to grow, and whilst my own career has seen me walk a different path, this dream is one I hold dear and hope to make reality at some point. However, it is at this time of year that is becomes particularly poignant as we see the florists on every high street and online gearing up to send out a million roses, all brought in from flower farms across the world in places as far away as Africa and South America. Covered in chemicals, they barely even look like the garden rose we know and love but instead always remind me of a cartoon rose. Sometimes they even look as if they are a little dog eared around the edges, with their long, straight stems and inability to open properly. Last year there were some studded with fake diamonds. They will last fleetingly, and briefly be a reminder that the special person in our lives has gone to the effort of buying a gift, but do these chemical ridden roses with their huge carbon foot print really say I love you? They are a part of our consumer habit. Just like the food we throw into our trollies in the super market, we know deep down that the claims made about them are untrue. In the same way as we know that a certain chains so called farms are just a marketing ploy to make you feel as if you are making ethical decisions, so the flowers we buy are the same. The idea that they are expensive at this time of year means they must be ok? And yet year on year we hear dreadful stories in the press about the reality of these equatorial flower farms, where mainly women work long hours in hot and enormous polytunnels, where mists of chemicals are often sprayed whilst they are in the houses and with little or no personal protection. Always there is an outcry and yet still the high street and online florists struggle to buy enough to get through the day. It's as if we know, but feel compelled but he greater force, the force that is consumerism. In Africa Lake Victoria, bordered by Tanzania, Uganda and Kenya and once supporting the livelihoods of 30 million people in those countries, is dying. Choked by algal blooms it is widely believed that some of the reason for this is the huge flower farms surrounding it, as they allow run off from chemical and fertiliser applications in to the lake. But the demand from the west is so huge it continues whilst keeping the workforce in those countries in poverty and ill health. 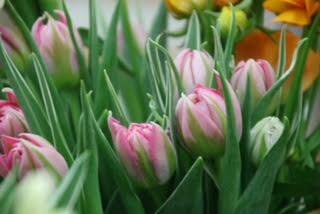 Soon to open double tulips that are scented! And it is because we are consumers and we can do nothing to counteract that. Or can we? Can we fight for a world where we are at least ethical consumers? Where we know that when we give a farmer or a maker our hard earn money rather than it disappearing into an off shore account to be given to a shareholder, that that money supports a family and a community. And the answer is yes we can. By supporting local veg box schemes, community supported agriculture, local farm shops and farmers markets, we can of course make more ethical choices. By buying through online markets such as Fresh Range and Farm Drop we can avoid the supermarkets and ensure we support great local producers. And although it might appear to be more expensive, by committing to great produce, from great producers who care about the food they are growing, whatever it may be, we will commit to less waste and ensure we get the most from the food we buy. Ask yourself how much you throw away from your supermarket shop each week? A simple menu plan and shopping list will stop this. Trust me. I know. It's how I shop and our bill is always more if we end up in a panic shop in the supermarket. But back to flowers!. There are no flowers in season I hear you cry. But there are I cry back at you. 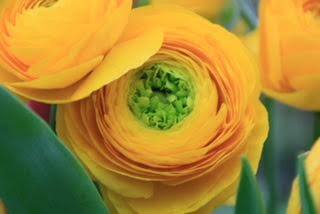 Narcissi, tulips, ranunculus, anemones and more are all flowering like crazy and available right now. it may not be an easy thing but ask your local florist what is UK grown and refuse to buy from the Dutch markets, which are the bottle neck between the large foreign growers and our high street and online stores. Or look at the British Flower Collective, Flowers From The Farm, both of whom can find you your nearest florist that supports our UK growers or your nearest flower grower so you can buy direct. And if that's not enough you could look on websites such as Common Farm Flowers and buy beautifully grown British Flowers direct by mail order, to be delivered to your love wherever in the UK he or she is. In the UK we spend £2 billion per year on flowers and at least 90% of that is for flowers that are flown in from abroad. Our British growers are mainly running their farms to agro ecological standards, just as small food growers do. Not only are they supporting themselves and the communities they are surrounded by, but they are also supporting our world, our environment and all the other creatures that we share the earth with. There are no algal blooms at Common Farm but there are earthworms, slow worms and the bird song is orchestral. Flower farms across the country are doing the same, creating a better world for all. Recently I have found my voice wavering. On social media I have been told I am wearing rose tinted glasses, looking back to a time through romantic eyes. That I have no idea of the pressures of family budgets. That I should be quiet. Sit down and say no more. For a while I felt silenced by the haters. But in the last few days I have remembered the voice I have and why I need to use it, and I will support small business for as long as there is breath in my lungs. We must begin to celebrate those who work on the land, or with their hands, creating beauty all around us. We must support them to move forwards, as a movement and in doing so lead lives where the really important things, family, community, eating together, kindness and love are what are seen as the important things in life, rather than the newest gadget. So why not start by saying I love you this year with a bouquet grown with love, kindness and hope? Not in a seed sowing or even planting kind of a way, but in a planning and how will this garden work for me way which is important when you garden like I do. I garden predominantly for me, but not just in a making it look the way I like kind of way, although of course that is important but I feel it's important to go deeper than that and look at ethics in the garden. Tithonias-rarely seen without a bee!! I am loathe to use the word organic, because for me that isn't quite enough. Organic for me is a tool for certification; a means to an end for recognition rather than an ethic. That is not to say I don't appreciate the effort it takes to get organic certification because I am more than aware of the skill and shear hard work that this takes, but unless I was going to open my garden, what would be the point? I'm not interested in opening my garden but I am interested in creating a space that is healthy, clean if you like, and that will support more than a nice place to sit. I want to support nature and there is definitely a challenge in that in a space this small. By supporting nature I mean I want to create a natural space that feels like home to wildlife, the flora and fauna all around us but that aren't there. Or at least aren't there yet. Now this is not new to me. Turning 40 acres of nursery from conventional to organic horticulture taught me a whole lot of things that had I not have had that opportunity, I may never have considered. There is truth in the saying, "make it and they will come", but patience is an important part of this process, as is living by the seasons and accepting that it will happen if you give it time. But back to the garden. It's a teeny, tiny space, maybe 5m by 5m. I'll measure it at some point but that measurement isn't all that important. What's important is that it will be jam packed to the rafters with beauty that will support nature in a somewhat curated way. All the plants will be good for insects and bees, and there will be spaces for invertebrates to hide. It may not be spotless, or look like a main avenue garden at RHS Chelsea, but it will be a haven for wildlife as well as for those invited into it. Doesn't have to be ornate! In previous gardens this type of feeder has brought in birds a plenty. What I have never had to factor into a garden previously is that into this already busy space I have to put food growing. At the moment I have no allotment, although 42 edible spaces across the city should stop me feeling bereft from that, but I do want to include both fruit and vegetables in my plan. This is going to lead to an interesting use of vertical space that will include products that will support using the walls as well as clever, I hope, use of archways and climbing plants. We will have to wait and see if this works, but I am entering into the nothing ventured, nothing gained ethos here, and if it doesn't work I can reassess and possibly look at an allotment. So what are you doing to start this process back to nature Sara, I hear you say? Well birds are the answer and as I sat in the garden drinking tea on Sunday morning I listened to the amazing chorus that is out there every morning and decided Sunday was the day to begin the process, if that is what you can call it, of bringing them in. I thought about a bird table but there were concerns over cats and also how much of the garden it would appear to be taking up, so instead we pootled off to Wilkinsons and bought a stand for bird feeders along with some new feeders, and filled them with peanuts, fat balls, nyger seed and a seed mix. And now we will wait and wonder who will be first to use it as they fly across the gardens that up until now they have ignored. I hope they hurry because I am spending an unearthly amount of time watching from the kitchen window. Zinnias-the darling of the cut flower grower but still great for pollinators. I'll keep you up to date!! And just in case you weren't aware you can find me on both Twitter and Instagram where I am @saralimback!! I woke up on Sunday with an urge for a botanical type visit to somewhere new, so we did a bit of Googling and decided to pootle off to The Living Rainforest, just off the M4 near Newbury. I am super interested at the moment in the way people are embracing houseplants and keen to remind folk that houseplants are garden and forest plants in other climes and I am trying to work out how we link the two things so that indoor gardeners realise that they are a part of the gardening community, even if they are just getting planty indoors. Anyway that's for another day!! The Living Rainforest is on the site of what was Wyld Court Orchids in Hampstead Norreys in Berkshire, and is run by the Trust for Sustainable Living. The greenhouses now house three separate rainforest zones, with appropriate planting, and some wildlife, from each in the separate zones. Sadly when we were there the sloth was hiding, but we did see his back. What amazed me the most is that the centre supports 23,000 school children per year to learn about the rainforest and it's importance for the planet, which for me makes it a space I will always want to support. If we are to change the way we perceive the world we have to turn children and young people into passionate environmentalists who will use future votes to make sure we protect what effectively protects us. I am not going to bore you with lots of words here because the photos really do speak for themselves, but what I will say is that this is a great place to visit with or without children, and if you are at all interested in what we today see as houseplants in their natural environments or just with each other as they would be in rainforests across the world, this is a great place to visit. Plus, go once, and you have a ticket for a year!! AND THERE IS A SLOTH!! Jade Vine (Strongyloden macrobotrys) from the Philippines. Monstera deliciosa and water lettuce in one of the ponds. Anthurium veitchii. The leaf was as tall as me! More ponds and more Monstera! I have had several social media requests for an update on the new garden so I thought a little something would be a good idea in the run up to Christmas festivities. As many of you will know we don't celebrate Christmas here at Venn Towers, preferring to celebrate the solstice and just take time out of our busy lives to rest and recuperate over the festive period. And with that usually comes a whole lot of preparation for the garden, ensuring that we are ready for the months ahead when life with my own space and supporting 41 others usually gets a tad manic. There is also a very new and exciting incredible edible Bristol project I need to tell you about soon, so watch this space for that!! Thus far I have really done very little. The garden is completely gravel so there has been a lot of weeding to do and that will need keeping up with as the blighters continue to germinate despite the cold. The aquaponics unit is in place and the fish survived the move, and we are working to make the system more sustainable next year with a solar pump and aeration but I will return to that once we get the equipment. My pots have been weeded and a fair few filled with bulbs so there will be some colour in late spring, and I have bought a bit of bedding to alleviate the grey. But what has been most exciting is a conversation I had with Burgon and Ball who have kindly agreed to gift me some products to really support the use of the whole space, whilst turning the garden into a really sociable as well as productive and beautiful space. At the weekend we put up the first of these which is a great peg board on which tools can be kept, as well as other bits and pieces which in my life usually end up being flung somewhere only to be found several weeks later, usually a bit the worse for wear!! I also have some of their amazing Flora Brite tools in pink, which should ensure my habit of going through lots of tools is abated because in a tiny space there is no way I can lose those tools. Or at least I hope that is the case! What I am most excited about with this type of product is that it, as well as the rest of the range it belongs to, the Garden Supplies range, can be used inside or outside, or anywhere in between, so people with balconies or just window boxes, could still use this range. For example I have the herb planters on my kitchen windowsill, bringing the garden into the kitchen. So that is where we are so far. There will be lots more to come over the following weeks so do keep an eye open for updates and let me know in the comments if there is anything in particular you'd like to know more about. 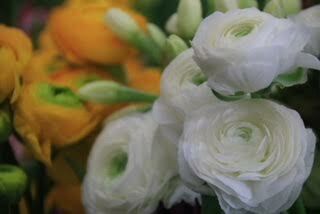 Common Farm Flowers | The Flower Farmer | British flowers by post. HMRC, growing a small business, VAT, Flower farming... the story goes on! I am a professional horticulturalist, plantswoman, gardener, garden writer. Since 2005 I have made my living from my love of plants, gardens and the natural world. I am a passionate allotment holder, am fascinated by permaculture, love all things flowery and also long to share my passion with others which I am starting to do by setting up a range of courses for adults, and running Tiny Trowels for Under 5s, all in sunny Bristol. I have also co-founded Incredible Edible Bristol and am a bit busy turning Bristol into the UK's 1st edible city!! Please ask before you quote from this blog!! Email sara@thephysicgarden.co.uk. Paying it back......working with Ross! !